A new month is upon us, and maybe the beginning of winter for the cascades. Here's to an active cold season. At the very least I'm hoping to get that coldest high number a little lower in the coming weeks. Early November had a very robust -PNA episode last year. One of the more impressive in years. My prediction...a White Thanksgiving, Christmas, New Years Day, MLK, Valentines Day, and Easter! Looking pretty ninoish to me. It is niño-ish, but the meridional expanse of the WPAC warm pool definitely doesn’t jive with it. That’s just a downright outrageous anomaly right there. WOUld that fuel more dateline forcing going forward? Perfect night for trick-or-treating. Rain stopped around 5 and it was dry and a little breezy and quite warm. Streets were packed with kids. Very festive. Several houses were having adult parties in the garage and driveway and a couple were handing out jello shots for the parents in addition to candy for the kids. Just a tiny bit of drizzle here and there here. Overall just cloudy though. The mild weather brought out quite a few kids this year. This was November 5th at Lake Goodwin. Currently light rain and 54. Lakemont area after the snow. Hopefully the snow will come later in November this time around. 57 this morning... warm start to November! 3/4” of rain since last night. 55 currently. Driest start to the year since 2008 for Seattle. Although the number of rainy days has been the same. This year has felt different in overall weather patterns than what has seemed to be the norm the last 3-4 years. And even so... SEA is just barely an inch below normal for the year. And WFO SEA is well above normal for 2018. This year could still easily end up above normal for the entire area. A good indication of how very wet its been around here for the last few years. I am hoping this seemingly change in the overall weather pattern recently will mean some better snow chances coming up. Rainfall warning in effect here. 1-3" possible by tomorrow morning. Drought! Just about 0.05" of rain since midnight. Should be a mostly dry day. The first half of November is looking mellow and mild. Yes, but if the off-equator SSTs are on fire like this, it might not work out in the manner you’re thinking. The defining characteristic of El Niño is an equatorward contraction of Pacific convection from 120W - dateline. This looks more like a broad/inverted WPAC exhaust pipe, with some similarity to 2014/15. Big difference this year is solar/timing of QBO flip (earlier). This year has felt different in overall weather patterns than what has seemed to be the norm the last 3-4 years. I’ve noticed a pretty stark difference here too. The weather has more “attitude” this year compated the last several years. Goes balls to the wall, then pulls back as if contemplating something. In my gut, I really do think we’re going to shift away from the perpetual vortex-dominated pattern that’s been unrelenting since 2014. 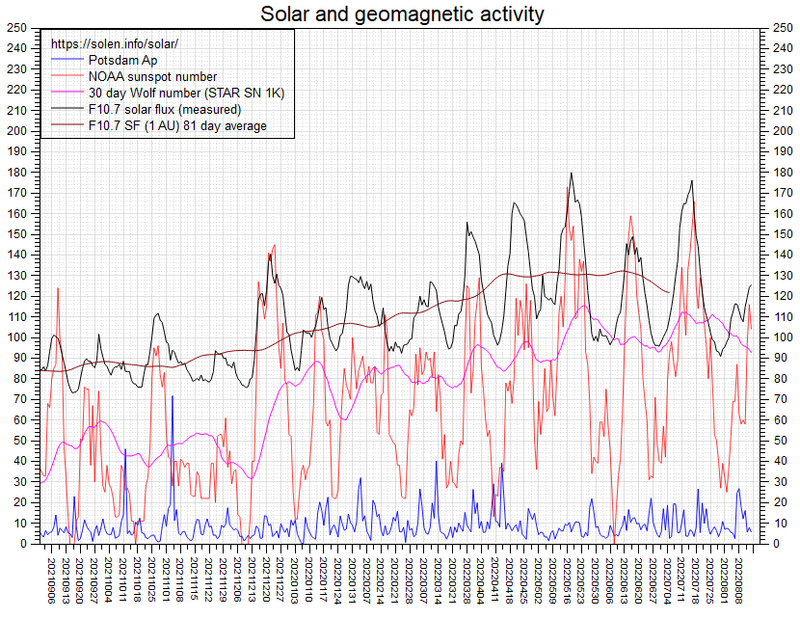 Of course, the objective data seems to suggest otherwise..
At long last, after a stretch of higher solar wind/geomagnetic activity, the AP index has returned to lower values more typical of solar minimum. November is such a crucial month in regards to geomagnetic forcing on upper atmospheric boundary conditions (it’s also a predictive precursor to SC25 amplitude at this point in the solar cycle). We want to see the AP index as low as possible for the next 2-3 years. Pretty strong PV during the second half of October this year. From October 10th onward the vortex has had a free ride. Still thinking this will (generally) continue to be the theme until December..then I suspect we see a wave-1 style displacement event occur (likely before New Years). But what if it’s more closer to the dateline? The cfs vp forecasts are indicating that could happen in later November/ early Dec.
What are you referring to? Velocity potential? If you’re looking for the predictive value in regional long range forecasting, there’s more the tropical forcing than merely the longitude of the largest anomalies in divergence/VP. The wavenumber and the various pathways of fluxes to/from the extratropics are all important. Impressive for a D11 ensemble mean. Mt Hood forecast. As schizophrenic as rainy season forecasts are (yesterday it was going to be sunny next week, now it’s going to rain, apparently) I’m still excited. I assume that is for the 11,000' level. Yes the velocity potential. I know there’s more to it but is it favoured by the end of the month? Also do you see the aleutian low coming back anytime soon? Interesting that after a low of 17 a few mornings back, that I ended up with 30 and 36. Right now my window is open. Yes we have heating system usually turned on now, so the rest of the house would not really notice. I'm surprised you are not trumpeting the mid/long range GFS which is dry and warm. Been in a meeting all morning... while the rain has been absolutely pounding on the roof here. Sounds like tropical rain out there. Looking at the national radar I am going to guess you are in either Nashville, St. Louis, or Columbus! Intense rainfall within the moisture plume which refuses to lift north... heavier cells kept re-forming over and over this morning out here. 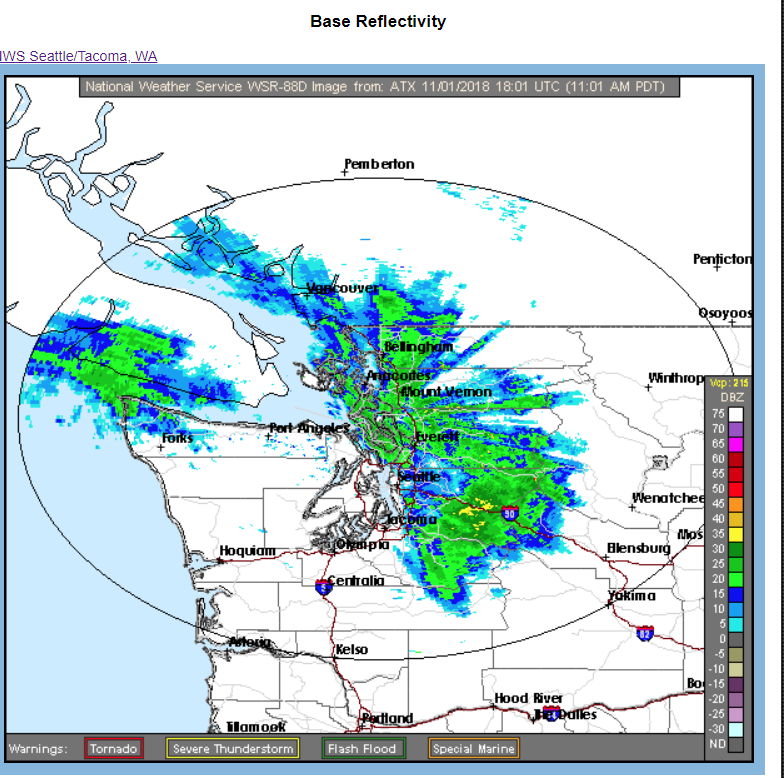 ...35dbz radar returns? So heavy! Lol..35dbz radar returns. So heavy! Heavy rain... picked up more than an inch since 9 a.m. here. I would like to have set you in my backyard this morning and you tell me how hard it was raining. Tropical connection to this rainfall right now. Rain drops are huge in this set up... very loud on the roof. Just reporting what is happening... no opinions. 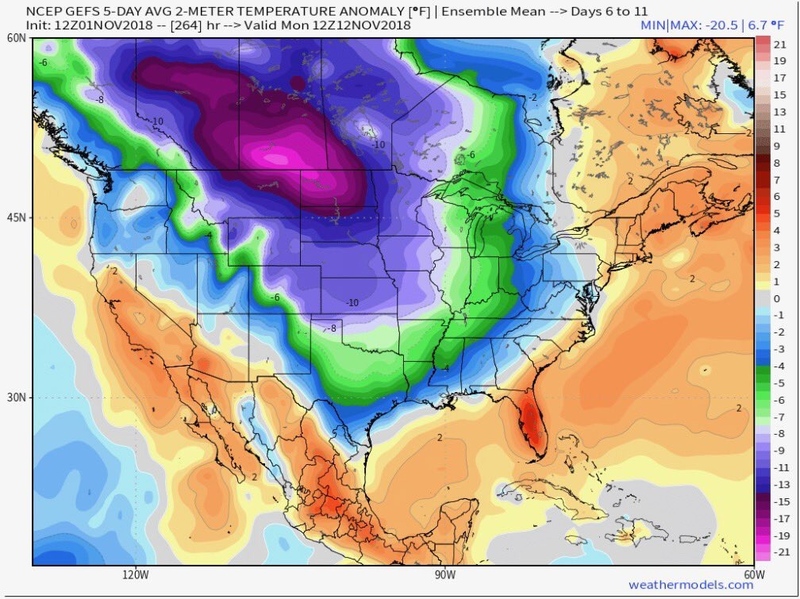 Full on arctic blast knocking on the door at day 10 on the 12z ECMWF and this place is pretty ho hum about it! Just saw that... would be nice if it worked out. Probably because it’ll knock but not enter. SEA NWS saying now that river flooding is possible by tomorrow. Decent blocking signal has been showing up around that timeframe for awhile now. Crazy, it usually doesn't do that out there. -28 this morning in Arctic Village, AK. Pretty impressive for November 1st.